Most of the time, clients are harassed and there is no recording of the incident. This situation is rare because they client had numerous friends in the court corruption arena (including me who also forewarned and forearmed her) that once she filed a complaint in Federal Court, or filed a grievance with the attorney registration board (which she did) or filed with the judiciary discipline board, it is not uncommon to expect a wide variety of harassment and intimidation for revealing court corruption publicly. 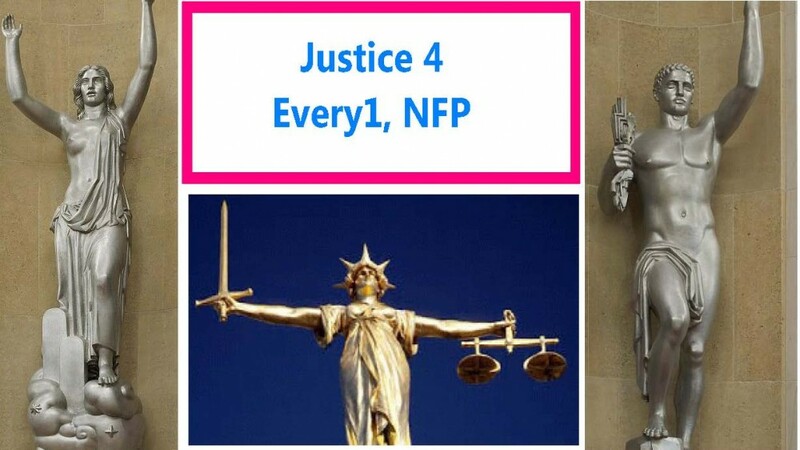 Important Announcement–Justice 4 Every1, NFP is now a 501-c-3 corporation and your donations are now officially tax deductible. I just got the letter today. Because of the letter, we cannot campaign for or against any candidate as a main part of our business. For that reason, please submit your posts in a format that does not identify and particular person who runs for office as a way to support them or discourage voting for them. Of course, we are still allowed to speak the truth about what happens in court and warn people about elder abuse, it’s just that we cannot make this a main part of our business or make it look like we are endorsing any particular person who runs for office. Reporting crimes and abuses of the system is different, and the public must be warned. If you want a tax deduction for your contribution, you must receive a donation letter from us at the end of the year, which we will provide upon request. I think this would be a great day for all the courtroom corruption victims to gather together with protest signs and make their voice known. There’s always media coverage at the Thompson Center for a large rally, and I know that Mick Gearhart is always a great activist working for fairness and accountability in our nation’s courtroom. Thanks Mick, for putting this together. Co parenting 50-50 is always best unless one parent is proved unfit by clear and convincing evidence. Far too often today the parent with the most money, the parent who sleeps with the judges or attorneys, ends up the winner takes all in custody battles. SHARON, Mass. – A hidden camera captured a 93-year-old great-grandmother being tossed around and her hair pulled in a Sharon nursing home and rehab last week. The video, set up by her family in her room at Wingate at Sharon, shows two women toss the elderly resident into her wheelchair. The resident, whose family, has identified her only as Dorothy, then struggles to maintain her balance. “Get the hell away from me,” Dorothy says. “You think you’re pretty smart,” as one aide shows Dorothy her fist. Seconds later, the other aide grabs her hair from behind and yanks her head around. The video from March 5 begins with Dorothy, who has dementia, swearing at and exchanging swipes with the pair. She threatens to break one certified nursing assistant (CNA)’s nose and says she will call police. Her granddaughter Kristen says Dorothy was defending herself. Best of all, if you have Amazon unlimited, it’s free. If not, it’s a bargain at $2.99. The book does an excellent job of detailing the harrowing end of days of one elderly man, age 72, who was in good mental health, and good physical condition. Once drugs are dispensed, it’s an easy step to have the person declared incompetent, put in a locked down nursing home where more drugs are dispenses–and every knows (or should know), if you were mentally competent prior to taking these drugs, they will ruin your mind and body. Earlier this month (October 2014) we reported the sad story of the Diegel family, who had their two daughters seized by Phoenix Children’s Hospital for disagreeing with the doctors over their treatment. We have previously reported many similar stories of hospitals using Child Protection Services (CPS) to remove children from loving parents simply for disagreeing with doctors, such as Justina Pelletier at Boston Children’s Hosptial, and Isaiah Rider at Lurie Children’s Hospital in Chicago. Behind each of these stories is a link to experimental drug trials for the same medical conditions these children were suffering. This prompted a group of lawmakers on Capital Hill to introduce new legislation to stop this kind of medical experimentation on children who are seized from parents and made wards of the state (see: “Justina’s Law” Seeks to End Experimental Medical Research on Children Seized by Child Protection Services).